I went through middle school and high school acutely aware of how much I was not playing D&D and wishing I knew who was so I could play again, but it wasn’t until recently, with the help of Facebook, that I found out how many people around me were playing in secret. 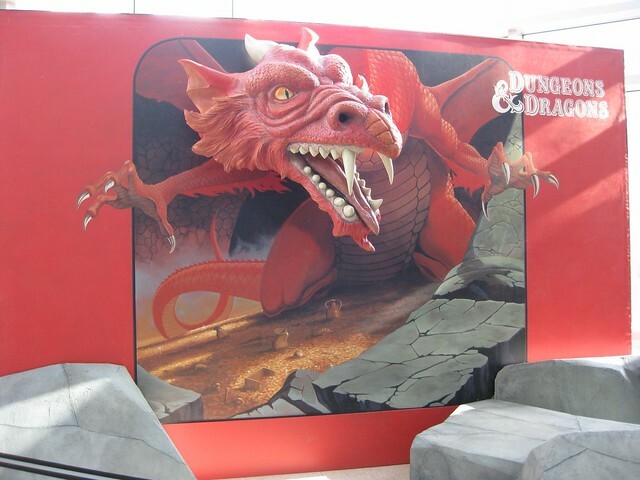 For most people at that time, Dungeons and Dragons was some kind of secretive right that was only spoken of in confidence with other known practitioners, played in basements and over garages, and denied in the face of outsider confrontation. For me, it was an unattainable beast, like a unicorn fleeting through the forest. I knew it was out there, but could not find it anywhere I looked. My mother gifted me with “The Red Box” and later “The Blue Box,” but aside from playing half halfheartedly with my brother, and occasionally taking on the role of Dungeon Master and Player simultaneously, I never did catch that elusive beast. Even through my first college years, I never found a group. I got closer, finding out that some of my hall-mates were aware of the game and had enjoyed its fantasy in earlier years. And yet, I never played consistently until my second stint in college, nine years after being initially introduced to the game, that I somehow landed in a real D&D group. Together, with those players, I’ve been through three editions of Dungeons and Dragons as well as numerous other games. The one thing I’ve learned from all these systems is that, in time, they all fall victim to the same fault. Profit. Every game system starts out with a potential for greatness. This potential is generated in part by the rules and the system, as well as the players and storytellers and how they use that system. Still others are improved over time by the addition of further and deeper material. But there is one thing to remember of all game systems, good or bad. Gaming books are all a product, published and sold to make a profit for the creators, producers, and publisher. what this means to us is that no matter how good the system is when it comes out, eventually one of two things is going to happen. Either a) the system will be flooded with “splat” material that tries to expand the setting and add more variety to the game, or b) the system will be discontinued and replaced with the “new” system. Either way, it usually brings about the pain and frustration heard around the world whenever Facebook updates its user interface. The folks that I’ve been playing with now for as much as 18 years started out in AD&D 2nd edition. By the time 3rd edition came out, we were all ready for something new and clean and we actually fell in love with it immediately. I even went so far as to ditch all of my 2nd edition books immediately. When 3.5 edition came out only a couple of years later, we were surprised at the overhaul so quickly, but were amazed that WotC would be so generous as to sell the initial three books for $20 a piece, a move that was completely unheard of. Due to such small print runs and low demand, gaming books are notoriously expensive, as a rule. Even if it was only a year before the prices went back up to the standard $40, it was a great incentive to upgrade. 3.5 made some great improvements on 3.0 and gave the developers the chance to trim back the “power creep” that occurs from the shotgun release of “splat” books. From a gamer standpoint, and more importantly, a budget savvy gamer, this was immediately seen as a way to milk more and more money out of the players. Which, to be blunt, is exactly what was intended. It was around this time that Pathfinder started gaining a real following, and rightly so. Pathfinder is the product of a lot of people who either worked with, or very close to WotC during the 3.0 and 3.5 days. At the demise of “their” edition, they did what most gamers can only dream of doing, they revitalized it by actually creating their own version of the system. The Pathfinder RPG is best described as Dungeons and Dragons 3.75. It’s licensed under the same Open Gaming License that several other quality third-party D&D products lived under (as well as many more disastrous products), and as such, is still an officially licensed product. What they did, though, was look over what had been developed in 3.0 and 3.5 and find the ways to make it better. Then, they wrote a book and put it into the hands of thousands of play-testers and asked for their opinion. The result is a surprisingly good system, based on an already enjoyable system, with a completely new, yet familiar setting and a purge of all the “splat” product. And they’re determined to keep the product clean by specifically and intentionally keeping their production schedule tight and minimal. To date, the core system is all in one book and there are only three books released to expand upon that system. Their setting, however, follows more the 4th edition model. It was released with fairly broad and overarching concepts and further books have focused on and expanded regions with increasing detail. This way, they are still producing a decent library of books, without fear of overloading the system with too much content. They’ve also taken an interesting direction with “periodicals” by releasing Adventure Paths. An Adventure Path is a series of six “magazine” released monthly that consist, in part, of an adventure spread across all six books, and a decent quantity of setting and system information and variation. Each book is half adventure and half flavor so you get a really nice mix of content in each book. While I’ve been playing in an Adventure Path with one gaming group for a few months now (Kingmaker), I’ve more recently begun running my own Adventure Path for the other gaming group (Council of Thieves). I’ve run a lot of prepackaged adventures before, but nothing has been as interesting or well prepared as this Adventure Path. The story itself runs like a series of modules with clear breaks in the action, but they all string together perfectly. The story and development are both interesting and fluid and all in all it’s just a really nice product. I never thought I would enjoy running it as much as I do. Running a series of disconnected modules always sort of feels just like that: disconnected. No matter how hard you try to string them together, there’s always a kind of disparate inconsistency to them. On the other hand, running a larger adventure book begins to feel like a marathon over time. No matter how far you get, there’s always an endless maze of dungeon left to delve through. It’s a grueling gauntlet to push through. The Adventure Paths succeed in feeling episodic, with breaks between books, and shifts in the focus and action. Each individual book can exist on its own, and yet they’re all tied together neatly. I could honestly see myself running more Adventure Paths in spite of the fact that my players are excited to return to my original story. I would love to really break down and establish a way to write my own story in an Adventure Path style, but I fear that I’m just not that forward thinking. I’ll have to give it some thought, however as we get closer to the end of Council of Thieves. Nevertheless, the important point to take away from this is that where D&D is again having trouble finding its way (as I write this, 5th edition is in development with an attempt to “crowdsourced” the project), I’ve found a new, better alternative. I’m loving Pathfinder and hope that the folks at Paizo continue to produce a spectacular product while maintaining a smooth, moderate developmental schedule. They’ve done a fantastic job finding a way to balance a quality gaming system without becoming aggressively capitalistic. From what I’ve read, I am not alone in this observation as presently Pathfinder is outselling 4th Edition D&D with no sign of letting up. I hope and plan to continue playing and promoting Pathfinder as the best Dungeons and Dragons product on the market. Maybe, as editions come and go, this will be the one that I cling to with an iron grip and refuse to ever give up on. Everyone has their ideal generation of gaming, I think Pathfinder may be mine.